Director Moffatt Oxenbould created this production of Madama Butterfly during his tenure as Artistic Director at Opera Australia. It remains one of the company’s best-loved productions, capturing the beauty of Japan perfectly. We asked the distinguished director to answer some questions about his work. Every director must make decisions about what elements of a story they wish to highlight. What themes form the focus of your reading of Madama Butterfly? Sian Pendry as Suzuki and Alexia Voulgaridou as Cio-Cio-San in Opera Australia’s Madama Butterfly. Photo by Jeff Busby. I came to this production after a more than 30 year association with the opera — and revelled in the dynamic of working with two designers who were coming to this great score for the first time. We provoked and stimulated each other! There was absolute agreement that Puccini’s Butterfly is a finely crafted work of the lyric stage that had gone through several informed revisions by its creators to arrive at the Paris version that we performed. We were inspired by the clarity and subtlety of the storytelling and sought to create a performance environment in which this finely-honed drama could be revealed by the performers — the intimate scenes that make up most of the work becoming a little like film close-ups translated into an opera house. An almost empty performance space made this possible. We were blessed with a marvellous cast of singing actors whose performances could withstand such scrutiny, and together we simply told the story of Cio-Cio-San and her American husband. Our approach was not to impose a concept but to reveal the beauties inherent in the work by stripping it of superfluous “decoration” and concentrating on its simple truths. You’ve drawn heavily on the traditions of Kabuki, Noh and Bunraku theatre. What inspired this choice? The various creators of the Butterfly story — Luther Long, Belasco, Puccini, Illica and Giacosa — were Europeans. None of them had ever been in Japan — so the Nagasaki that they imagined was a Japan seen through European eyes. We were initially inspired by the work of American artist James McNeill Whistler and his amazing paintings of European people and places with a very clear Japanese aesthetic. We also realised that an Australian audience today would have a much more first hand and informed experience of Japan and things Japanese — and Puccini’s score allowed us to tease out this thread. We invented a theatrical Japan — not bound by strict adherence to Japanese authenticity — for example, the screens that enclose the set move up and down rather than from side to side. Some of the movement is from Kabuki and Bunraku — some from other Asian theatrical disciplines — some of it is pure invention. The main Kabuki feature we have incorporated into the staging is the use of 5 koken — the masked stage assistants who serve the actors and the action without actually being part of it. They deliver props for the moments in which they are needed as part of the action and enable us to employ the Kabuki device of quickly changing costumes — usually to emphasise a change in a character’s development. Cio-Cio-San arrives wearing the pink costume of a geisha. 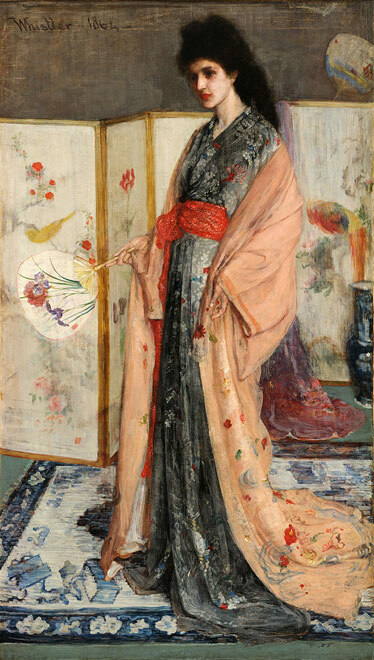 The koken whip off the pink costume to reveal a blue kimono when her blue-clad relatives arrive. For her marriage to a westerner this is in turn replaced by a pearly white kimono without much colour — conforming to the blandness of the tones of the costumes worn by the two American characters. Kabuki is an art form that shares much of the boldness and bravura of Italian opera — and while Madama Butterfly is set in Japan, it is also one of the greatest of Italian operas! You show us a Japan very much through Pinkerton’s eyes. How does this contribute to the impending tragedy? 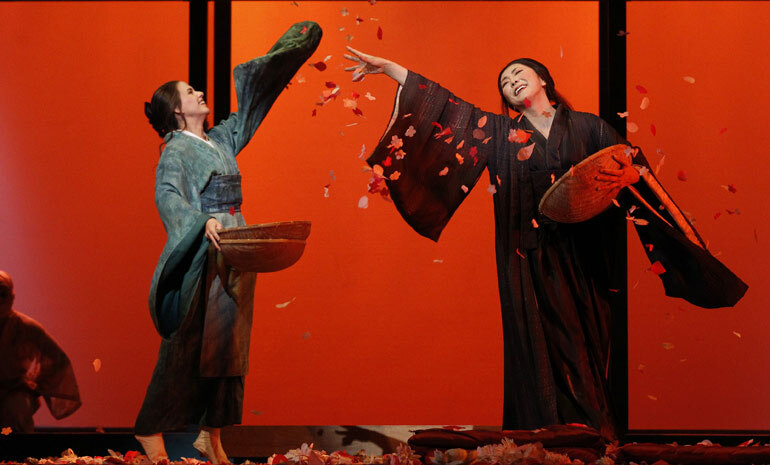 Hiromi Omura in the title role and James Egglestone as Pinkerton in Opera Australia’s Madama Butterfly. Photo by Jeff Busby. The opera tells the love story of two people from different backgrounds. As it unfolds, the tragedy involves Pinkerton as well as Cio-Cio-San. We meet Pinkerton as a brash, young man thrust into a fascinating technicolour Oriental world after months of monotonous days at sea. His bride appears as an exotic, almost mysterious, “doll”. When she is cast out from her family and the two young people are left alone, both of them begin to change. What each thought was going to be the predictable “scenario” turns into something much more profound. Everything comes from the music — as they shed the outer “skins” that identify them as a kimono wearing Japanese and a uniformed American officer, they grow before our eyes, transcending race and background and becoming just a boy and a girl discovering the wonders of love in a seductively scented garden against a star-filled sky. In the final act Pinkerton’s remorse is genuine — returning to the once familiar surroundings of his Japanese home he realises that as a man he was at his happiest and most fulfilled three years earlier when he was with Cio-Cio-San. His natural emotions at discovering that he is a father are contrasted with the reality of having caused grief to his new American wife, disgrace to his country and despair at the awful destiny he sees ahead. The most telling clue to Pinkerton’s character is his calling out Butterfly’s name three times at the very moment she has ended her life. It must be heart rending — his despair is achingly real — and Cio-Cio-San — as she dies, hears in his voice the truth of Pinkerton’s remorse in an awful but powerful benediction. His love was real — and she was not a fool to believe that this was so. How do you think the themes of Madama Butterfly can speak to an audience today? Hiromi Omura in the title role, Michael Honeyman as Sharpless and James Egglestone as Pinkerton in Opera Australia’s Madama Butterfly. Photo by Jeff Busby. A great operatic work can be interpreted many ways and still retain its integrity. We chose to set our staging at the time of its composition, in 1904, because the behaviour of the characters seemed to sit most credibly in that period — before film, television, air travel, etc. — when Japan was a little known foreign land — filled with allure and mystery. While there have been many fine updated stagings, it seems a little far-fetched to imagine in the 21st century that Cio-Cio-San would wait for three years without somehow making contact with Pinkerton! But the work endures and still speaks because it is a very accessible and involving love story. No matter how many times we have heard and seen the opera, Puccini’s genius and the artistry of sensitive present day interpreters, can engage us — and we succumb to the composer’s words — “Great griefs in small souls…Not too much psychology but sympathetic understanding of human grief…to make the world weep…therein lies everything”. The composer: Giacomo Puccini. Italian. 20th Century. Also famous for La bohème, Tosca and Turandot. The music: Numerous Japanese influences in this opera, with the inclusion of both bells and tam-tams often seen in Japanese songs and arrangements. The big hit: The heartbreaking 'Un bel di vedremo' (One Beautiful Day) is the aria that every soprano dreams of singing. The history: The opera gathers together Balasco’s play (based on John Luther Long’s short story) and material from Pierre Loti’s novel Madama Chrysanthème to create the full, three-act tale of Cio-Cio-San’s betrayal. A quirky fact to impress your date: Puccini rewrote it five times — and the fifth and final is the one usually performed around the world.